If you're looking for lodging in Sequoia National Park or its sister park Kings Canyon, you're planning a trip to one of California's most beautiful mountain areas, and you're probably anxious to get started. But — you need to know a few things before you get started. Because the contiguous wilderness areas are operated by no less than four different government entities, it can be challenging to find out about all your lodging options. We've collected them all here, regardless of who runs them. If you're looking for a place to camp rather than a hotel or cabin, use the guide to camping in Sequoia and Kings Canyon. 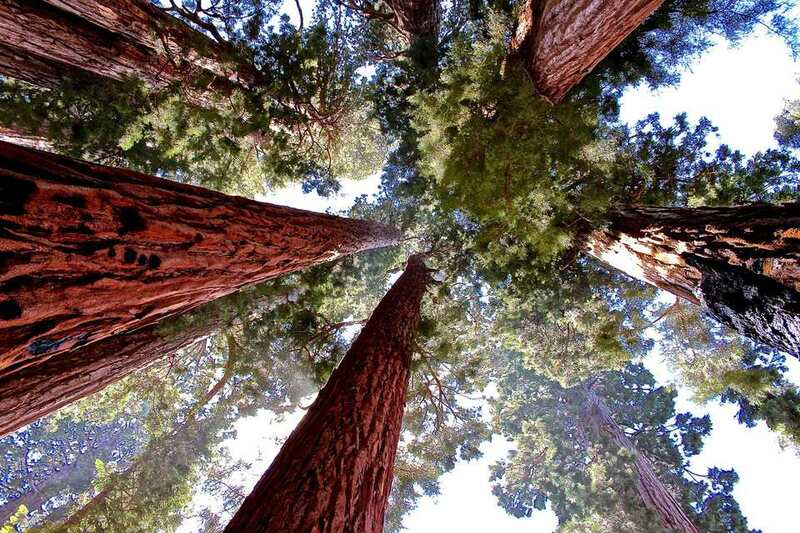 What's the difference between Sequoia and Kings Canyon National Park? Technically, they are two separate parks administered jointly by the National Park Service. They share a common border. If you didn't see the signs posted, you could easily think it was all the same place. Mineral King is inside Sequoia National Park, reached by turning off CA Hwy 198 near Three Rivers. This area is remote and closed in winter. The properties in this area are privately owned. The Cabin on Mineral King Road: An off-the-grid experience about 7 miles from the town of Three Rivers. Big enough for a large family or small group of friends. Silver City Resort: Open May through October, it's a 90-minute drive from the main parts of the park. Sequoia National Park lodging is available at a hotel-style lodge run by a concessionaire and a privately-run tent camp. Wuksachi Lodge: This hotel is the newest lodging in the parks. It is run by Delaware North. They have a restaurant on site and accept pets with a daily fee. On the downside, wifi is limited, and rooms are not air-conditioned (not that you need AC much at their elevation of 7,200 feet). Sequoia High Sierra Camp: No bare-bones camping here, where 36 luxury canvas cabins combine a wilderness camping adventure with the comforts of home. To get there, you can drive to a trailhead and hike just 1.5 miles. Open July through October. Kings Canyon National Park lodging includes cabins and two lodges, all run by concessionaire Delaware North. Grant Grove Cabins: 41 individual cabins in the middle of the park, close to a restaurant and small store. John Muir Lodge: 36 rooms in Grant Grove with a restaurant nearby. Cedar Grove Lodge: At the end of the road in Kings Canyon with 18 rooms, a store and snack bar. It's open only when the road to Kings Canyon is open. These places to stay are within the same area as Sequoia and Kings Canyon, but not inside the park boundaries. Montecito-Sequoia Lodge: A family that is sandwiched between the two parks. Their all-inclusive rates make it easy to stay there. Stony Creek Lodge: It's not technically in Sequoia National Park but is on the General's Highway in Sequoia National Forest, open from May through early October. The town of Three Rivers is just outside the southern entrance of Sequoia. Lemon Cove is also nearby. Visalia is also an option for a place to stay, and so is Fresno. They're perfect for a stop on your way to a one-day visit to the parks, but if you're going for more than one day, it's a long drive to get there and back from either of those towns. If you decide to stay in Visalia or Fresno, here's how to find a place to stay. Look at a map and determine what town or towns you want to stay in. Don't just look at the distance in miles. Instead, use an online mapping service or app to find out how long the drive takes. Then use the same process we use to choose our recommended hotels. Once you've picked a few suitable candidates, apply all the best tricks to get the lowest possible rate. Bed and breakfast inns are mostly located in or near the town of Three Rivers along CA Highway 198 just outside the Ash Mountain entrance. It can be hard to find all of them without spending countless hours searching online, but you can use bedandbreakfast.com to check on many of them at once. You can find places to stay by searching for Sequoia National Park at Airbnb. Keep an eye on the map when you do that. Otherwise, you might end up staying much further from the parks than you intended. In fact, if you zoom out, you could end up choosing something on the other side of the mountains that could be many hours' drive away. You'll need more than just a place to sleep while you're in Sequoia and Kings Canyon. You also need a good plan. Take a look at things to do in Sequoia and Kings Canyon for a weekend getaway.